Growing Protea flowers can be really rewarding - trouble is for some who live on the Coffs Coast this is not really easy as they DO NOT like heavy clay soils. 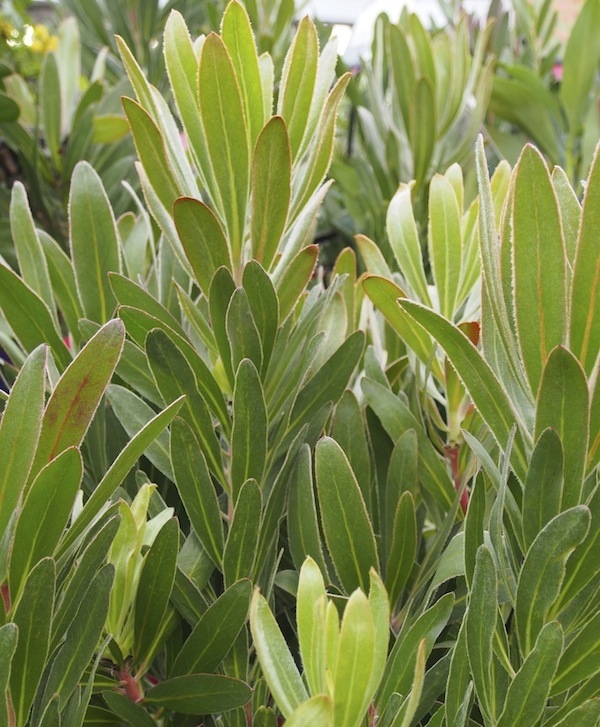 The above image is of a King White Protea growing in a Boambee garden - obviously conditions in this garden suit it. Proteas are in the Proteaceae family, which includes the banksia, grevillea, waratah and hakea. Proteas are often mistaken for an Australian native however, they are from a special group of Proteaceae from South Africa, which embraces species from the Protea, Laucospermum and Leucadendron genera. 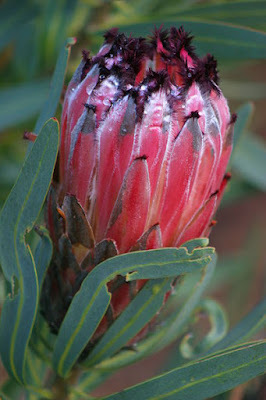 The King Protea has the largest flower head of all the genus and is South Africia's national flower. If you are wanting to grow a Protea in your Coffs garden it might be best to start with a P. 'pink ice' as they don't seem to mind heavy clay soils, success could be yours! When growing Proteas the first thing you need is an open, sunny position with very good drainage. They will do excellently in poor soils and many don't seem to mind salty, coastal areas but...... humidity is not their best friend. So if you are attempting to grow Protea here on the Coffs Coast, it might be best to introduce some sandy loam and mound it and plant your Protea in that. In an ideal world you would be growing a Protea in a sandy, acidic and even slightly improverished soil, with a north facing aspect in full sun - the more sun, the more flowers. Good air movement is vital too because of our humid conditions. Like their Australian cousins, Proteas have a really low tolerance for artificial fertilisers. In fact, superphosphate can be the death knell to these beautiful plants. Having said that though, they require a good source of magnesium to assist with flower production. A fistful of Epsom salts scattered directly over the root zone and watered in well will be beneficial in the spring. Mulch your Proteas using a natural mulch such as bark, straw or leaves - do not use mushroom compost. Don't disturb the plant roots when weeding as they have surface, matting roots that are easily damaged. Therefore to transplant a plant might be instant death as well! It is not really necessary to prune Proteas - especially if the blooms are cut for the vase or blooms are regularly 'deadheaded'. Occasionally it may be necessary to prune to thicken up the growth - this is best done in early spring, after flowering has ceased. Use harder pruning methods to shape a plant that has become leggy and untidy looking. If hard pruning, the number of blooms the following year may be limited, but the one after that should be stunning! Perhaps another option worth considering for the Coffs Coast is to grow Protea in pots but these will need to be have a slow release native blend fertiliser given to them occasionally. The position for this pot would be similar to one grown in the soil - north facing with lots of sun. Be mindful though, potted Protea will require careful watering, especially during bud formation where their requirements will be greater. If you do grow a Protea you'll have to be patient as some take up to 3 years to bloom and the king Protea can take up to 6 years to flower! Still thinking of growing a Protea on the Coffs Coast?